We've traveled south from big El Dorado County to tiny Amador County, which resembles a painting by Grant Wood or Andrew Wyeth. We're back on State Route 49 (the Golden Chain Highway), crossing over steep canyons on long-legged bridges. The Amador Creek Bridge (49 0043) is a four span prestressed concrete continuous box girder structure that passes high above tiny Amador Creek. This bridge was built in 2007, which made me wonder how people crossed the river in 2006? It appears (after looking at Google earth) that they must have driven over the river on Old State Route 49 (to the east) before this new highway was built. The northern border of Amador County (and the southern border of El Dorado County) is the South Fork of the Cosumnes River. 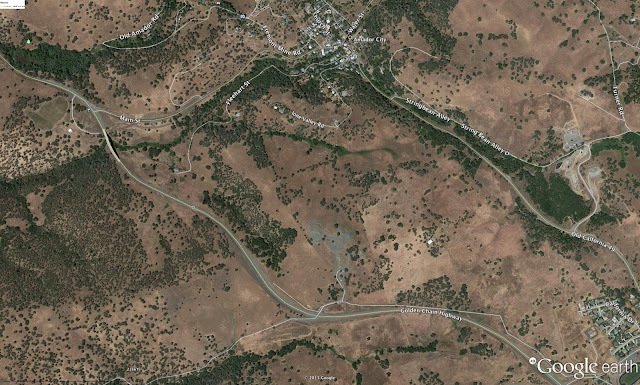 The southern border of Amador County (and the northern border of Calaveras County) is the Mokelumne River. The Cosumnes River, the Mokelumne River, and the Tuolumne River, all have the 'umne' suffix meaning 'people of' in the Miwok language. Amador County is squeezed between the Cosumnes and the Mokelumne. We'll look at many new and old river crossings in Amador County over the next couple of weeks. Amador County, California Bridges: State Route 49 Bridge across Amador Creek by Mark Yashinsky is licensed under a Creative Commons Attribution-NonCommercial-ShareAlike 3.0 United States License.